FITS: SEARS, POULAN, HUSQVARNA, RALLY. OEM -TWIN ENGINE MUFFLER. TWIN CYLINDER ENGINES. WE WILL DO OUR BEST TO ENSURE YOUR EXPERIENCE EXCEEDS YOUR EXPECTATIONS! IN WHICH YOU RECEIVED IT. NEW MUFFLER ASSEMBLY WITH GASKETS AND MANIFOLD! 1X MUFFLER ASSEMBLY. 1X MANIFOLD. COMBINED ORDERS: We will combine all orders when possible. THE FINE PRINT . CRAFTSMAN RIDING LAWN MOWER TRACTOR ENGINE MUFFLER # 188655. THIS IS NEW AND OEM. DON'T BUY A CHEAP CHINESE IMITATION MUFFLER WHEN YOU CAN GET THE REAL THING AND SAVE REAL MONEY. THIS FITS BOTH KOHLER AND BRIGGS AND STRATTON SINGLE CYLINDER ENGINES. Kohler 24 786 05-S, 2478605-S, 24-786-05-S. Specs: Intake pipes 3 to 3-1/2" and 3-3/4" to 4-1/4".2-1/8" filter side outlet. 15" canister length. Bracket only on 1 side of muffler. FILTER SIDE OUTLET. HUSQVARNA POULAN AYP CRAFTSMAN RIDING LAWN MOWER ENGINE MUFFLER # 137352 FOR BRIGGS AND STRATTON OHV SINGLE CYLINDER ENGINES. THIS MUFFLER IS NEW AND OEM. FABULOUS INVENTION FOR SURE. MSRP OF 79.99. Overall length is 8" Inlet and outlet are reversible. This is new and very Heavy duty! Dual Inlet Muffler. Includes Deflector does not include self tapping bolts. Tire Chains. Mower Drive Wheels. Replaces part # 751-0616B. Bluetooth headset. Chain Tighteners. Snowblower Parts. 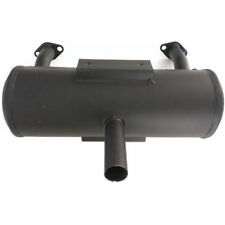 Muffler only part number 03946900. 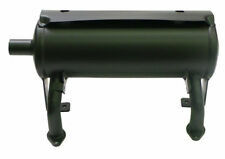 New Kawasaki Muffler, Fits Kawasaki 20HP to 24HP - FR, FS, FX series 651v to 730v Vertical shaft engines . The Manufacturer’s Warranty policy will not cover any transportation costs associated with a warranty. GX160 5.5HP. GX200 6.5HP. NEW MUFFLER ASSEMBLY! 1X MUFFLER ASSEMBLY. COMBINED ORDERS: We will combine all orders when possible. THE FINE PRINT FITSHONDA MODELS. These mufflers are mis-runs inlet hole stamped a little bit to big see pictures. You can weld it closed or expand your pipe to fit hole. Part No: 494585. 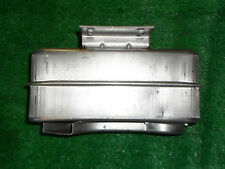 Genuine, OEM Briggs & Stratton muffler, part# 494585. Briggs & Stratton. Genuine, OEM Briggs & Stratton parts. (1) Muffler. Genuine OEM. Save Money. Experts are standing by to help you. For use on most 5 to 8 HP engines with 3/4" threads in exhaust port or on muffler elbow. 3/4" pipe thread. Helpful Links. Brand new Non genuine exhaust assembly and gasket Compatible with Honda GX110 GX120 GX140 GX160 & GX200 Material Iron Color Black Dimension approx. 13.5cm x 10cm x 15cm Suitable for Honda GX110 GX120 GX140 GX160 & GX200 Type MUFFLER / EXHAUST Country/Region of Manufacture Hong Kong Brand Unbranded/Generic MPN WW608415765998 UPC Does not apply EAN 608415765998 Brand Unbranded/Generic MPN WW608415765998. Brand New Rotary Muffler For 3/4" · Fits Kohler 220521S, 220521Z · Fits Tecumseh 29633 · Pipe Size: 3/4” · Rotary Part number: 1279. California Prop 65 - This product can expose you to certain chemicals, which are known to the State of California to cause cancer or birth defects or other reproductive harm. Canceling Your Order. We recycle! TAKEN OFF NEW ENGINE Command Twin Muffler, fits 18-25hp Horizontal Shaft engines, exhausts out left side Kohler Engine Parts, Kohler. manifolds are 3.25" and 4"Length of muffler is 14” Manifolds ctc are 11.5” Mounting holes c to c are 2”. Craftsman muffler. single cylinder engine. 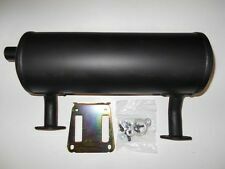 CRAFTSMAN 42" CUT RIDING LAWN MOWER MUFFLER OEM # 137348 FOR BRIGGS AND STRATTON ENGINES. THIS FITS OLDER MODEL BRIGGS ENGINES THAT AREN'T OHV. WORE OUT MUFFLERS ARE BAD FOR YOUR ENGINE AND YOUR EARS. 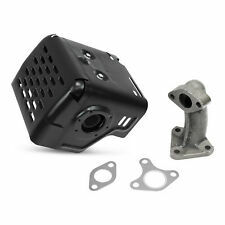 Fits Cub Cadet: LT1018, LT1040, LT1042, LT1045, LT1046, LT1050, RZT-42, 1170, 1515, 1517, 1600, Z Force Z-42. Genuine OEM Single Inlet Muffler. Fits: MTD: FST16, LT13, LT1300, LT135, LT14, LT145, LT1450, LT15, LT1500, LT155, LT16, LT165, LT17, LT175, LT1800, LT1855, LT542, LT942, YM1338, Z-165, ZT-16, ZT-17, ZT-1850, ZT-2150, ZT-42. Part No: 690776. 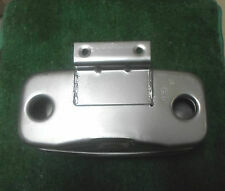 Genuine, OEM Briggs & Stratton muffler adapter, part# 690776. Briggs & Stratton. Genuine, OEM Briggs & Stratton parts. 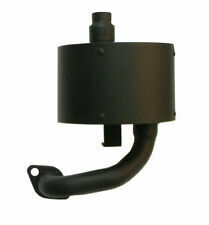 (1) Muffler Adapter. Genuine OEM. Save Money. Experts are standing by to help you. Part number 137352. 179758, 532137352, 532179758 supersede to 137352. Genuine FSP lo-tone muffler. JOHN DEERE AM39089 AM39327 LG394569 LG394569S. 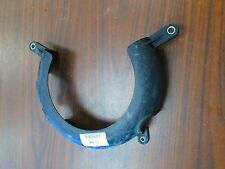 Replaces (OEM): BRIGGS 298830 391435 394569 394569S 5019. OD: 3 1/8". 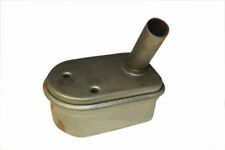 Muffler fits FH601V, FH641V, FH680V, or FH721V Air Cooled Vertical Shaft Engines Kawasaki Engine Parts. Product Width:10". Honda GX120 - GX160 - GX200 Engines. ProvenPart Muffler for. Complete muffler, includes heat shield. exhaust pipe and gasket. Replaces Honda Part 18310-Zf1-000. Bolt on Muffler for Kohler. Fits Kohler K-161 & K-181 Engines. GX340 11HP. GX390 13HP. NEW MUFFLER ASSEMBLY WITH HOUSING! FITS HONDA MODELS. 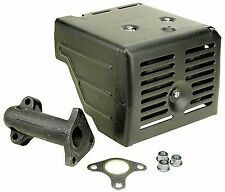 Briggs And Stratton Muffler Fits most engines from 10 HP to 12-1/2 Hp.Thread dia. 1-5/16", 1" inside dia., 4-1/2" long pipe. Tecumseh Muffler Kit. This Muffler fits the following Models:Ech90 Ecv100 H22 H25 H30 H35 Lav22 H25 H30 Lav25 Lav30 Lv35 Lav35 Lav40 Lav50 Tvs75. SINGLE CYLINDER BRIGGS ENGINES. MTD 751-10448C 751-10448D. Fits Models. ROTARY PART # 1272. ROTARY MUFFLER 1/2" PLATED PIPE. REPLACES THE FOLLOWING BRIGGS & STRATTON PART NUMBERS FITS THE FOLLOWING BRIGGS & STRATTON MODELS Briggs & Stratton Diamond Dealer. Kohler Expert Dealer and a. Fits Briggs &Stratton. 3/4" Male Threaded. 6 1/4" Total Length. 190400 to 190799 &170700, 171700 8 HP Horizontal Shaft. Price is for one muffler. this sale is for the long and narrow hot dog bun style exhaust with male pipe thread. Mower Blades. Mower Parts. Lawn Mowers. Lawn Spreaders. Zero Turn Mowers. Snow Blower Parts. Power Cutters Accessories. Air Filters. HH40 H50 HH50 H60 HH60 H70 HH70 SERIES ENGINES. Part Number Fits Models. We are a Toro Master Service Dealer. PART # 106-7007. Briggs & Stratton Diamond Dealer. Kohler Expert Dealer and a. 11HP GX340. 13HP GX390. Muffler & Manifold Exhaust System. MUFFLER WITH MOUNTED. Interstate Supplies and Services. SET OF (3) NUTS. REPLACES OEM #7074453. SNAPPER RIDING MOWER/GARDEN TRACTOR. BRIGGS & STRATTONREAR ENGINES. MODEL NUMBERS ARE USUALLY FOUND UNDER THE SEAT OF YOUR MOWER. HEAVY DUTY. RC60-71H, RC60-72/A, RC60-27. WE WILL DO OUR BEST TO ENSURE YOUR EXPERIENCE EXCEEDS YOUR EXPECTATIONS! 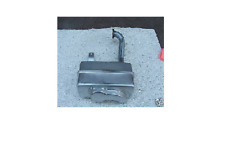 SNAPPER REAR ENGINE RIDING MOWER BRIGGS POWERED MUFFLER REPLACES 7074453.